Is Paul Ryan's Departure a Disaster for House Republicans? 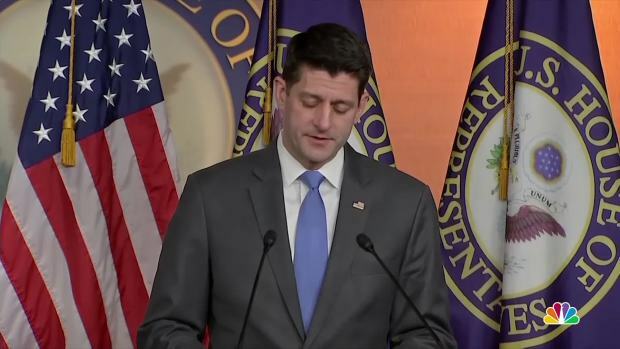 After House Speaker Paul Ryan announced he would not be running again, GOP House members are scrambling to keep their seats and find a suitable replacement for the speaker, NBC News reported. The main goal for Republicans is to keep their majority in the House. Ryan's decision to exit the House has opened the door for other Republicans to fight for his seat, such as Rep. Jim Jordan, who said Friday that he will see about whether to run when Ryan steps aside in 2018. And Majority Leader Kevin McCarthy, R-Calif., and Majority Whip Steve Scalise, R-La., are both interested in the job. Ryan expressed support for McCarthy in an exclusive interview with NBC News' Chuck Todd on "Meet the Press."